Though open to criticism for its obsession with the brutality of modern life, this 1948 film by Vittorio De Sica is undeniably the most important neorealist film after Rossellini's Open City. As a man searches for the stolen bicycle that means the difference between work and unemployment, De Sica explores the terrible dehumanization of postwar life—and finds that loneliness is its unifying theme. In Italian with subtitles. 90 min. 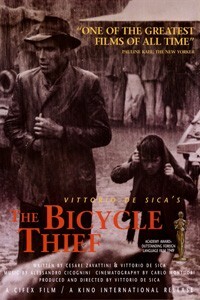 Bicycle Thieves and Bicycle Thieves are not showing in any theaters in the area.